Fujitsu fi-6400 scanners digitize tens of thousands of documents a day. With proven feed mechanics and high quality image cleaning, the fi-6400 supports a spectacular throughput, providing businesses with tremendous ROI. As promised, Fujitsu has delivered a reliable production scanner in a quiet and compact space. 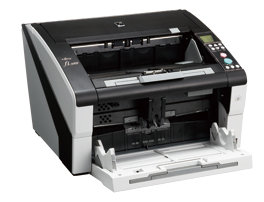 Fujitsu fi -6400 Production to improve productivity and maximize efficiency. Performance Scanning With the duplex scanning speed of 200 images per minute at 300 dpi in color, grayscale, and monochrome, the fi -6400 performs up to 30,000 scan per day. Minimum ADF: 2.1 in. x 3 in. ADF maximum: 11.7 in. x 17 in. Dimensions (HxWxD): 18.1 in. x 16.9 in. x 12.2 in.